Simon & Garfunkel’s third studio album, Parsley, Sage, Rosemary and Thyme, followed their smash hit The Sound of Silence. It was released in 1966, and built on the American duo’s already rising musical legacy. Parsley, Sage, Rosemary and Thyme is a collection of twelve songs brought together by an overarching pastoral theme. Lyrics rooted at a particular time of year, or directly related to the seasons make a sharp contrast to the usual city-focus of popular music, leaving the songs more reflective, giving the listener plenty to think about. The opening track, Scarborough Fair/Canticle, from which the album title is lifted, is a case in point. Borrowed from a traditional English folk song, possibly dating back to the Seventeenth Century, it weaves in Simon’s anti-war song, which introduces another reoccurring theme to the album within a mystical sound and historical setting. It’s hard to imagine any act other than Simon & Garfunkel getting away with anything quite so audacious and surprising. Patterns takes a strong percussive beat in an autumnal song (“falling leaves”) about the cycle of life, while Cloudy laments the lack of sunshine and the seasonal affective disorder we can all feel in the winter months. Homeward Bound is perhaps their best-known song on the first side. Simon recounts the exhaustion of touring and performing, second-guessing the merit of his lyrics, and longing to be “home”. For anyone who’s ever missed home, it’s intensely powerful, with the words and melody so neatly encapsulating tiredness, loneliness and a longing for rest and security. There is a mixture of emotions though, and after the satire on commercialism of The Big Bright Green Pleasure Machine, the first side rounds out with The 59th Street Bridge Song – with its skippy, upbeat refrain of “feelin’ groovy”. The levity doesn’t last into the second side. The delicate arrangement of The Dangling Conversation doesn’t hide the subject matter of a relationship that has reached ennui and a natural end. Nor does a faster pace for Flowers Never Bend With the Rainfall hide the central idea of the essential futility of life. A Simple Desultory Philippic (Or How I Was Robert McNamara’d into Submission), which is as verbose as the title suggests, channels their inner Bob Dylan (name-checked in the album in a neat joke about Dylan Thomas) and for a snappy two minutes gives the listener an up-tempo piece that doesn’t entirely sit comfortably within its surroundings. Art Garfunkel’s haunting solo vocals on a live performance of For Emily, Whenever I May Find Her, are undoubtedly one of the highlights of the album. They sublimely complement Simon’s song, and act as a reminder of what Garfunkel could bring to the partnership. A downside is that it makes the following track, A Poem on the Underground Wall, which is sung together, rather more forgettable. The intention is to create the sound and tempo of an Underground train, but this comes at the expense of the lyrics, some of which are lost. The album rounds out with 7 O’Clock News/Silent Night, in which the duo sing the traditional Christmas carol to the soundtrack of a news reporter relaying the horrifying developments of the day, which culminates in Richard Nixon’s comments on the Vietnam War. Effective, but not subtle, and as a piece of anti-war propaganda, it doesn’t offer a contrary view. The final song is indicative of the problem that, although Parsley, Sage, Rosemary and Thyme has some terrific songs on it, especially Homeward Bound, it doesn’t fully cohere, and there’s an absence of subtlety in the satire. Their later work, such as Bridge Over Troubled Water, achieved a greater maturity and richness of sound. 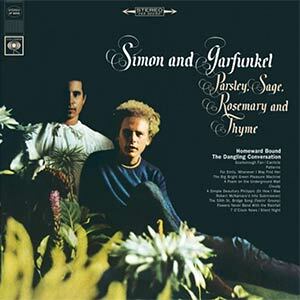 But as a piece of mid-1960s folk music from one of the most gifted songwriters of his generation, Parsley, Sage, Rosemary and Thyme still stands on its own merits, even though it’s not Simon & Garfunkel at their most brilliant, polished and compelling.